Car history information website such as Car-Fax and Auto-Check are very helpful, they cost very little and provide you with much information. Many cars reported show no accidents recorded or reported, but have indeed been in accidents. I have seen many cars at dealer auctions that have previous accident. even frame damage, announced that didn't show up on the website. In all fairness, they do warn that they don't have all the information, but I believe many consumers get a false sense of security when the vehicles are reported with no accidents reported. I would be more than happy to walk around a car with you and within five minutes I can show you points to look for and you can catch repainted or reconditioned parts on a car. Often the bolts that hold the fenders or hood or trunk lid have the paint busted off because they have had wrenches on them. Also, over spray on the edges of these panels leave the finish rough when it should be very smooth. Many cars such as Toyota, Honda, Kia, even some Fords have a strip about the size of a bandage (1/2" x 2") on each and every panel of the car with the VIN # of the car on each strip. If a part of the car has been repainted or parts replaced these VIN # strips will be missing. The instrument panel is a (free) built-in vehicle inspection in itself. The check engine will pickup many if not most minor and major engine problems. If the light stays on after you start the car you have a least a minor tune-up problem if not more. When you start the car the picture of the airbag should light up for a few seconds and then go out. If it doesn't come on at all that means your light is out and you don't know if the airbags are functional or not. If the airbag light stays on you know there is a problem with the system. It is not uncommon for some car dealers to break these dash lights so buyers won't notice that they have airbag, ABS, or check engine light problems. I would be happy to give you a demonstration of what to look for if you decide to come and look at one my cars. My cars are usually priced $500.00 to $700.00 over my cost. If you find people offering vehicles with the same options as mine for less money, the probability is high that they have been previously damaged in an accident. Not many people are pricing their cars $500.00 over their cost. The ones that are announced with frame or unibody damage will usually sell for $1000.00 less than one that has not been in an accident. Many dealers are selling these cars and not announcing accident damage to the buyer. Before January 2006, Car-Fax, in my opinion, has been the leader as far as the most information about a car. Often I see wrecked vehicles, but it doesn't show up on Car-Fax or Auto-Check. However, as of January 2006, Manheim Auctions, the largest dealer auction in the United States, started reporting all frame damage cars that go through the Greater Chicago Auto Auction to Auto-Check. You really need to run both Car-Fax and Auto-Check if you want to get all the information that is on-line. There could be more companies that have information also, I'm only telling you what I know at this time. To use Car-Fax or Auto-Check without locating VIN stickers or using the digital depth gauge would be an incomplete manner to evaluate the condition of a vehicle. Most new cars have VIN stickers on each panel, hood, door, etc. Although it is not fool proof and someone could counterfeit a VIN sticker it is still a reasonable guide to tell if you have the original panel on a car. It doesn't necessarily tell you that the original panel has been repainted because of dents or scratches. This is where the digital depth gauge come in handy. The pictures below will show you the location of the VIN stickers on a 2009 Hyundai Sonata. When you go to a car lot and salesperson tells you that "as far as I know the car has not been in an accident", the salesperson is showing his lack of knowledge. In the future respectable salespeople will be showing you the VIN stickers, a digital depth gauge as well as both Car-Fax and Auto-Check. Please click on the images below to enlarge them and get a much better picture of what I am describing above. Thanks. 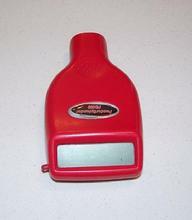 This is one brand of paint meters, there are many more. You can buy one of these for approximately $330.00. I never know what the paint specifications are from the manufacturer, so I use this meter on every panel of a vehicle to look for consistency in paint thickness. For example, most cars will have about a 5 mil paint thickness on each panel. So when I see a panel that has 10 mils of thickness, I have a pretty good idea that the panels has an extra layer of paint. Someone with a really good eye probably doesn't need this meter, but on rainy, frosty or snowy days I consider it a very helpful tool. I realize the cost is too much for most people and for that reason I will allow you to use it on my vehicles or rent it to you to use to check out my competition.